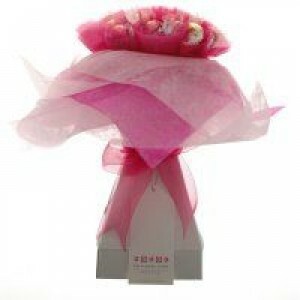 Baby Girl Sugar & Spice Chocolate Bouquet is the perfect way to welcome a new baby girl. Baby Girl Sugar & Spice Chocolate Bouquet is the perfect way to welcome a new baby girl. Chocolate Bouquets are hand crafted and arranged within a colour coordinated presentation box  no vase required! The free standing box vase, encloses two dozen long stemmed chocolate buds contain only the finest Lindor Lindt chocolate truffles. Contains one dozen dark chocolate & raspberry truffles. Contains one dozen white chocolate truffles.